Are you seeking for ways and means to make your windows spotless yet again? Would you like to know how to skip nuisances like window cleaning without lifting a finger? You have picked the right company – the experts of window cleaning in Tooting will take care with this matter in the blink of an eye. Your windows along with their frames and ledges will look great, we ensure that! You will no longer have to give up your spare time – the results of our activity will fully delight you. Our services blend first-class quality with reasonable price rates, so don't hold up – request an estimate now to save time, energy and money! We also provide our professional services in nearby areas: Colliers Wood, Merton, Bromley Common, Leaves Green, Mitcham. The experts have the abilities and the needed equipment to provide you with both private and commercial window cleaning. You can depend on us for all types of glass surface cleaning. For example, we can clean small or double windows, French doors, sash windows, bay windows and patio doors. Moreover, if you have garden glass surfaces, greenhouse or roof windows, we can clean them as well. We use the most progressive methods and the latest equipment for all the previously mentioned window types. We are happy to use the best methods to make sure that you have the finest window cleaning. The glass surfaces of your building are going to look spotless after we utilise water-fed extension pole system and jet washing on them. We use our vans to supply the poles with water and we can reach as high as the fourth floor. In case you require polishing of windows on taller buildings than that, we have rope access window cleaners on hand. Call us on 020 3746 3113 and get in touch with us – these effective procedures will bring you results right away. Improve the look of your property – the professionals of commercial window cleaning will take care of that. As part of our specific technique, we use water-fed extension poles. With this technique, we can clean entirely the exterior of your office, up to the fourth floor. To reach higher windows we use rope access. We make sure your windows will look pristine, regardless how high is the building. With the help of the team of cleaners London's skyline is never going to be filthy. 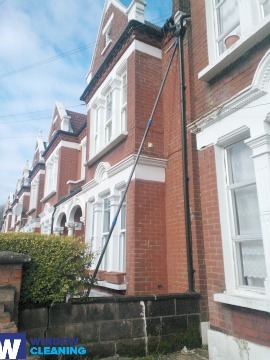 With our speedy and efficient residential window cleaning in Tooting, you will improve the look of your home at once. We use purified water for inside and out cleaning of your windows. We make this possible by clean from the ground with water-fed extension pole system, which is safe both for your property and the cleaners. Learn more – get in touch with us on 020 3746 3113 or use our online booking form. You can also use our chat facility. Our operators are active 24/7 – you will get answers to your questions. You can be one of our content customers today!